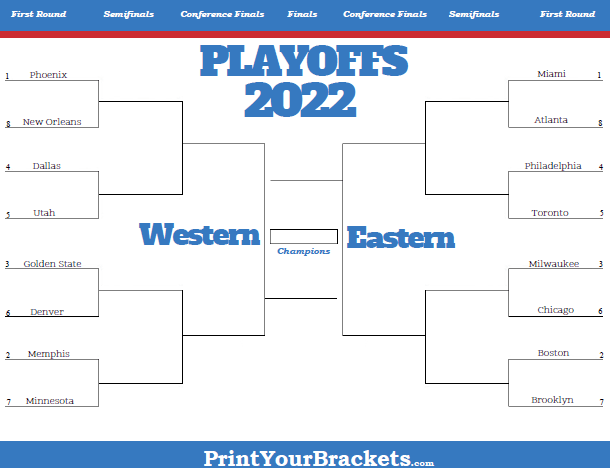 Below you will find our Printable 2019 NBA Playoff Bracket. For Dates, Times, and TV Channel of each game, check out our 2019 NBA Playoff TV Schedule! Try our NBA Playoff Square Pool! This is similar to the traditional March Madness bracket pool, where you will try to correctly navigate the teams through the bracket. Each round's correct picks are awarded a certain number of points. The person with the most points at the end of the playoffs wins. Read below for a complete explanation on running this pool and check out How do the NBA Playoffs Work and also When Do the NBA Playoffs Start, for a complete playoff schedule! We have also come up with a couple other pools that you can run during the playoffs. The first being the NBA Playoff Squares which is similar to the Super Bowl Squares except you will be writing the team names in the top row(Eastern Conference) and left column(Western Conference) instead of numbers. The square that intersects the two teams playing in the NBA Finals wins! The second pool is the NBA Playoff Confidence Pool where the participants rank each team in the playoffs from 1 to 16. Each time a time wins they are awarded the corresponding number of points. Print out the playoff bracket from above, estimate the total number of people you think will be interested in entering the pool and print that many brackets. Pass the printed brackets out to friends, family, and co-workers. Each person is to fill in the bracket with the team they think will win each series. For a tie breaker have each person write down what they think the total number of points scored in the final game of the championship series, or you can use your own idea like total points scored for the entire championship series. Collect the brackets before the playoffs begin, if you want to to do a little extra for the participants, print every person in the pool a copy of every other person's bracket. This is a lot of printing but ensures to all people that the pool is being run fairly and allows them compare their picks and results. After the championship game calculate the total number of points by each participant. The person with the most points is the winner.